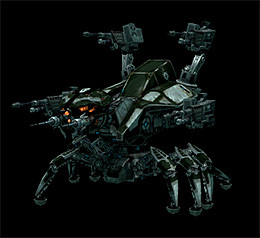 As announced in the previous blog, we are developing 11 new robots belonging to the Syndicate faction. The first wave of these robots is just around the corner, so today we’ll take an in-depth look at them. In terms of offense, the most notable attribute of the hybrid Nian-Earth tech Syndicate robots is of course their specialization for firearms. These types of guns are famous for their almost negligible energy usage, their damage and versatility coming from the available ammo types, but also for their inaccuracy and short optimal range. 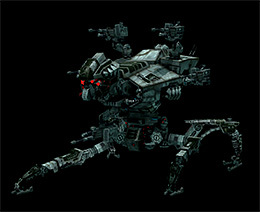 Syndicate robots were built with this in mind, and they are also trying to compensate for the shortcomings of these weapons. Defense-wise their main strategy is basically to not get hit. Their armor is the weakest of all the factions, and armor resistances are universal but not very high. However, this is more than made up by their low hit size, either from the get-go or via bonuses, which can be further reduced by using an evasive module. Looking at their base speed, they are rather on the slower end, but their relatively high mass means that they won’t lose that much of that speed when you equip them. Last but not least, their signal detection and masking values are the best in their class, making them exceptionally useful in scouting and covert operations. TL;DR Syndicate robots are hard to hit bulletstorm glass-ninjas. 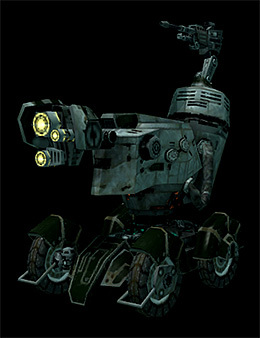 These are mostly true for the combat-type robots, but we’ll also have 5 industrial types within the Syndicate faction. They are generally intended to fill some missing roles and industrial classes, and their traits will be a mix of the Syndicate flavor and the robots of the Nian Industrial Trust. Let’s take a look at the first 3 robots in detail. Note that the parameters can still change and we’ll revisit them once they’ve been in use for a while. "The smallest member of our hybrid-technology fleet of robots. Its armor is weaker than the average, but its small size makes up for it, resulting in a hard to hit target. Coupled with excellent detection and masking systems, the Vektor makes not only a good scout, but a tough opponent in combat as well." "The gist of our firearm-wielding force. A swarm of Locusts can quickly shred enemy groups, but their specialized framework increases their survivability in solo engagements too." "The Ikarus is a snappy answer to the Perpetuum Project's long-standing need for a fast and light transport. Its main element is a repurposed Argano-chassis, stripped of anything disposable to make room for the relatively large cargo hold. Aided by the agile undercarriage of the Laird, this is the most efficient robot to get fair-sized packages from A to B quickly. Speed comes at a price though, as the construction is very fragile." We’re introducing two new extensions that will be required to control these robots: Syndicate combat robot control and Syndicate industrial robot control. It’s not hard to guess that these are the equivalents of the Pelistal/Nuimqol/Thelodica robot control extensions (with the same complexity of 9), but since here the combat and industrial types are part of the same faction we felt the need to split it up into two extensions. The rest of the requirements are designed to be on par with the other factions and are using the same extensions, depending on the robot’s class. Of course the introduction of a whole new faction can’t go without some adjustments to the existing factions and robots. With each patch we’ll take a look at the balance within the actual class of robots and make changes if necessary. This not only means that we’ll balance regarding the newly added robots to try to fit them in, but we’ll also revisit the balance between the existing old factions. Finally, during or after the last waves we’ll check up on the global balance between robot classes and try to fix some long-standing issues e.g. with speeds. This first wave of Syndicate robots is planned to be deployed in patch 3.8, around the middle of next week, along with some fixes as usual. The exact time and date of the patch will be announced soon. The rest of the robots will be introduced in a similar way over the next few months: a detailed writeup of the actual wave of 2 or maybe 3 robots will precede their deployment, and the waves are currently planned to be 3-5 weeks apart, depending on any additional features or fixes that may come with the patch. Interesting concept for the combats! Looking foward to it! Will they have mk2 version? Nice one, for me the token prices are really low. At least multiply them by 10. Ikarus seems worthless compared to sequer and sequer MK2. In addition, I don't like the idea of leaving indy players out of it by not allowing us to make new bots. Instead we must do more and more boring missions over and over to get from syndicate shop! How does this inspire more pvp and additional players into the game? Humbly, my two cent worth. Ok, I don't understand the complaining. The new transport bot's cargo is very small, but lets see how it works first. It only takes 3 assignments total to get the tokens needed for the 3 NEW bots. Not a big deal. I still want an account ep reset ... lol. Can you confirm something for us Zoom? It will take tokens from all three factions to purchase these robots?? I have to agree with Lonwolf here. These are supposed to be man made robots, not alien robots we take over. So how come we can not build them?? Yes, what I listed under "Syndicate Supplies cost" is all what you need to purchase them.